Posted on March 22, 2017 by Seriously Free Speech Committee| Comments Off on SFSC Event April 5: Why is Canadian professor Hassan Diab still held in French jail? What can we do? Dr. Hassan Diab, a sociology professor at the University of Ottawa, was arrested in 2008 in connection with the deadly bombing of a Paris synagogue that occurred in 1980. Throughout his long ordeal – imprisoned and under house arrest in Canada for 6 years, extradited to France in 2014, and now nearly 2 ½ years in a French prison without being charged – Diab has maintained his innocence. The Canadian judge who extradited Diab described the French case as “weak” and concluded that a conviction was unlikely if tried in a Canadian court. However, France’s new anti-terrorism laws permit courts to rely on secret “intelligence,” that has never been disclosed to Mr. Diab and could be potentially derived from torture. Human rights and civil liberties groups–including the BCCLA–opposed the extradition. Don Bayne, a leading criminal defence lawyer who fought the six-year extradition battle pro bono, called Diab “Canada’s Alfred Dreyfus.” Diab, a Lebanon-born Muslim, is a victim of mistaken identity, sacrificed to make France look tough on terrorism. Dreyfus was a French Jew wrongly accused a century ago – a time when anti-Semitisim was strong as Islamophobia is today. 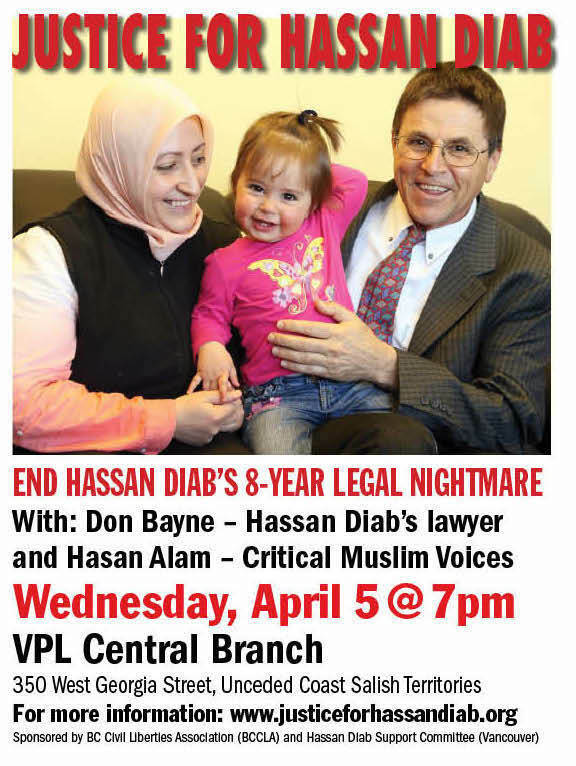 Sponsored by BC Civil Liberties Association (BCCLA) and Hassan Diab Support Committee (Vancouver). Endorsed by Critical Muslim Voices, Independent Jewish Voices, Canadian Association of University Teachers and Seriously Free Speech Committee. This entry was posted in Media, Other Campaigns, SFSC and tagged SFSC Event. Bookmark the permalink.